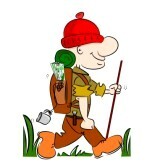 Are you a visitor to Comrie who would like to join some of the Strathearn Ramblers walks ? Or maybe your a local who would like to enjoy an occasional walk ? The good news is, you can ! Visitors are welcome to participate. However, the group retain the right to refuse if the person/s are not equipped for walking, for example, inadequate clothing, flip flops, etc. Also, the group do not accommodate vulnerable persons unless they are accompanied by a responsible adult, for example, persons under the age of 18. Visitors who wish to participate must pay £1 to cover insurance costs. If you wish any further information please contact Irwin Keith on 652541. In the meantime here is the Summer Newsletter if you need to refresh your memory or to plan a walk.